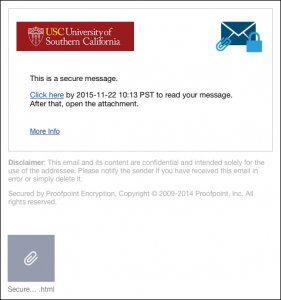 To allow faculty and staff to securely and selectively send sensitive email messages to recipients outside of USC, ITS has enabled opt-in email encryption for Office 365 and Gmail for Faculty. 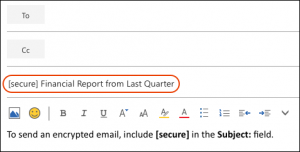 To encrypt an email, simply add [secure] to the subject line and send the message as normal. ITS recommends that you inform your recipients to expect a secure email. While the message your recipient receives will prompt them on how to open a secure message, you may also want to send them a link to this page for an overview of the secure message process. NOTE: Steps are different for users with email addresses ending in @med.usc.edu. Please contact the Keck help desk at 323-442-4444 or helpdesk@med.usc.edu for more information. Recipients of an encrypted email will not be able to access the message directly from their inbox. Rather, they will receive a separate email indicating that they have been sent a secure message. The recipients will need to click the link to access the Proofpoint portal. If your recipients have not yet set up an account with the Proofpoint encryption system, they will be prompted to do so at this time. If your recipients have forgotten their account credentials, they may reset them by clicking the Forgot Password link in the Proofpoint portal. Once your recipients log into the Proofpoint portal, they will be able to read your message and reply to you. Due to security considerations, your recipients will only be able to reply to the message; Reply All and Forward functionalities are currently disabled. NOTE: Encrypted emails will expire after one month. If a recipient has not read the message before it expires, you will need to send it again. For more information, see smail.usc.edu/help/enus_encryption.htm. Encryption operates on a message-by-message basis; you cannot encrypt an entire email chain. If a recipient replies to your message and you wish to keep the chain secure, you will need to re-encrypt your reply as described above. Recipients may download attachments after logging into the Proofpoint portal. For additional assistance with Proofpoint Encryption, contact the ITS Customer Support Center.